Ultrasound is simply high-frequency sound waves above the range that we can hear. 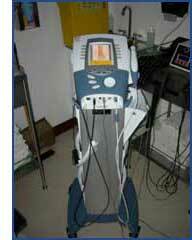 It is applied to the body from the ‘head' of an ultrasound machine. A gel is used to help the waves travel into the body rather than be reflected off the skin. Increased blood supply which promotes healing. The specialist will apply a little gel to the skin and place the head of the ultrasound machine on the skin. Usually, it will be moved in small circles. Treatment time can vary according to the injury but is usually about a few minutes.